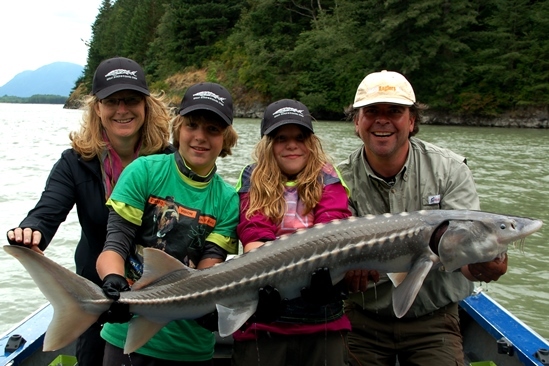 Summer time suggestion: Fraser river sturgeon! 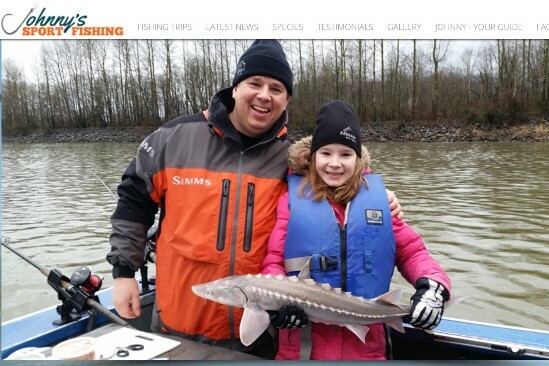 As a part of the 2014 summer holidays to Canada with the family last year, I have been able to fish for sturgeon on the Fraser river, nearby Chilliwack, British Colombia. An opportunity I obviously could not let go by the moment it became clear that coming out of the national parcs of Banff and Jasper we would actually pass this “sturgeon fishing hotspot” on our way to Vancouver! Now, a year later, this experience still holds many sweet memories and i decided to put it down to “paper” after all. 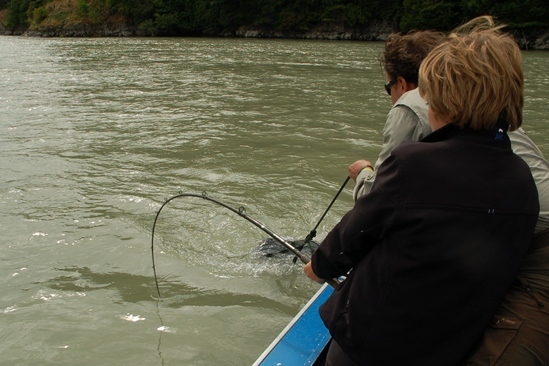 Sturgeon fishing on the Fraser river holds a strong reputation since decades. 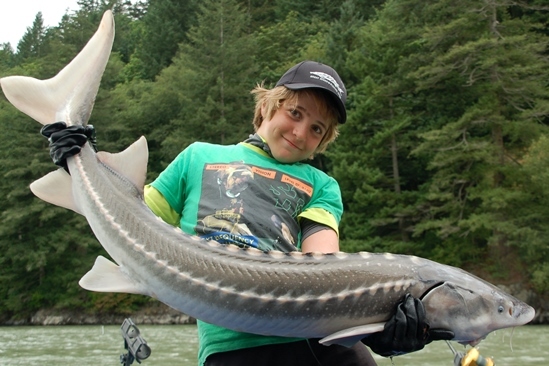 Each year monster size sturgeons are being caught and when I say monsters I mean true monsters! Fish up to 3 metres in lengths with weigths that can only be guessed, hundreds of kilo’s! 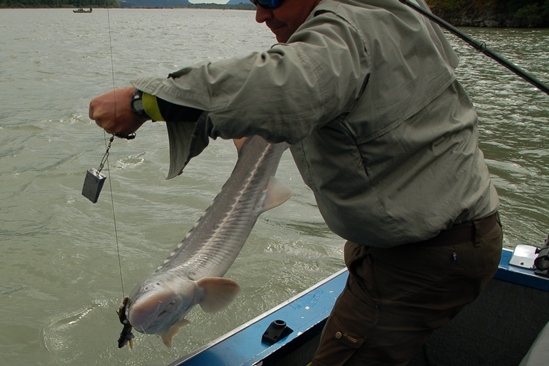 Obviously not only monsters are caught; the river is filled with sturgeons of all age classes and being there in the right period more or less guarantees you the catch of one of these beautiful prehistoric fishes. 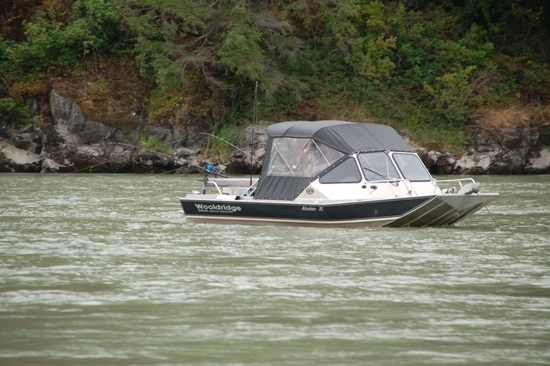 Many fishing guides are active in this area when you scan the Internet. And this makes it more difficult to choose. 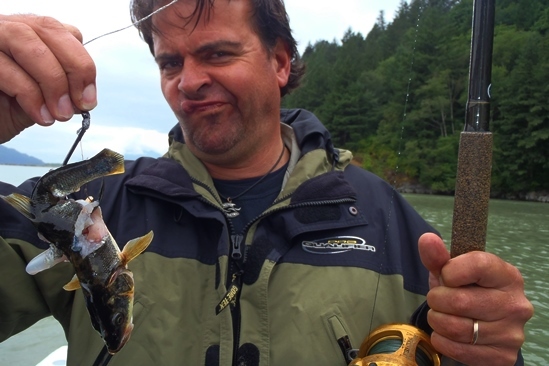 I fished for two days with John Waring and that turned out to be an excellent choice! 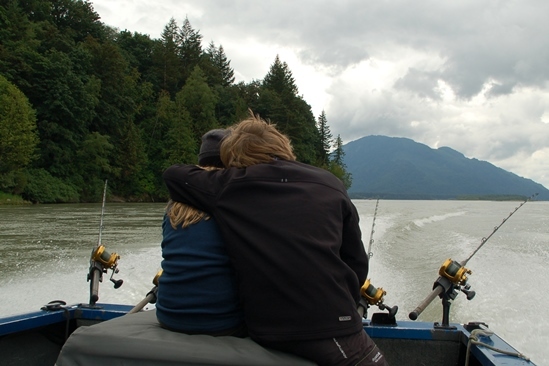 John has been fishing most of his life on Fraser river, he is a very nice guy to fish with and having a young family himself made him look after my kids very well too! The day before our two days fishing trip we arrived at Chilliwack and put up our RV (camper) on one of the Chilliwack campgrounds. John would pick us up the next morning. The first day would be with the whole family, the second day I would fish by myself unless otherwise decided at the end of the first day. This would also depend on the weather of course and unfortunately the weather forecast for the first day was not too favourable. The next morning we were anxiously waiting for John to arrive. 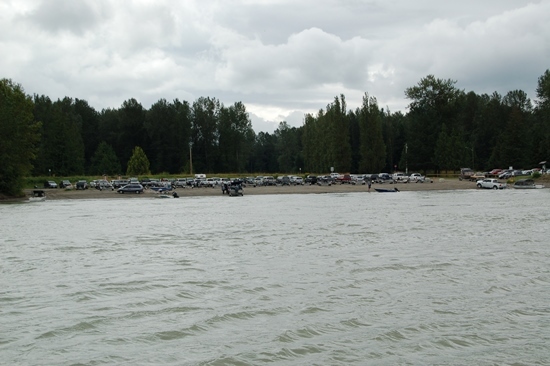 Exactly on time he pulls up his truck and boat in front of the campground and after getting introduced to each other we step in to head off for the river. The drive to the boatramp lasts only 15 minutes and shortly we see a large number of cars parked on what for me is the largest boatramp I have ever seen. At least 20 boats could launch on this place at the same time, directly from the sand into the river! Fortunately for us it is busy but not overly crowded. Lots of them are fishing for salmon too, the season is just about to start and many of them are camping on the banks trying to get their specimen salmon. Efficiently John launches the boat into the river and shortly after parking his car we are heading off: ready to catch some sturgeon! 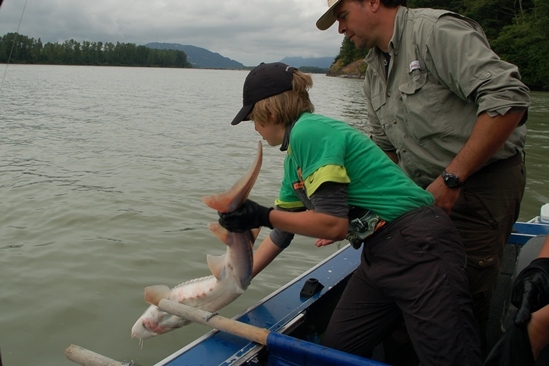 The fishing for sturgeon may look easily but drills down to the specific use of a number of variables. 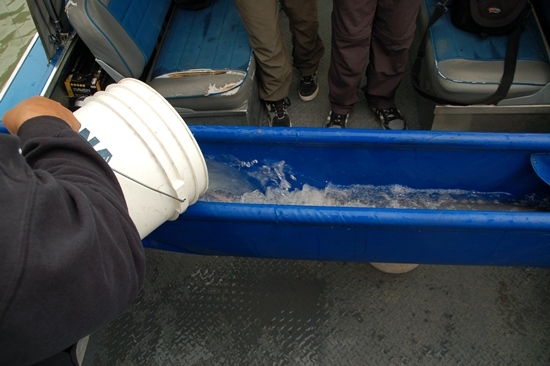 As sturgeon is most of the time feeding from the bottom, bait needs to be presented there using sufficient weight to keep it at its place in the (strong) currents and still presented as natural as possible. 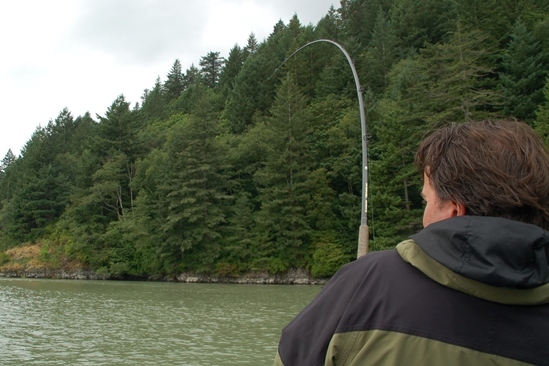 The baits itself varies strongly, also depending on the naturally available bait to the the sturgeon. 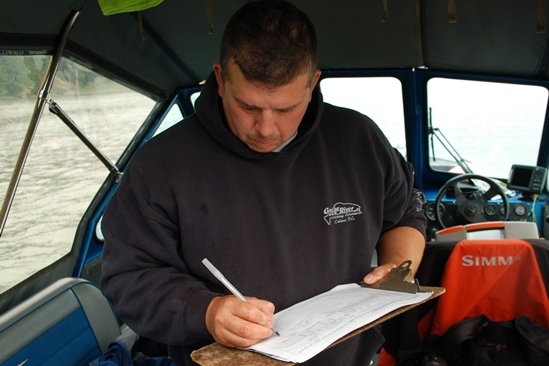 Selection of the fishing hotspots is crucial. 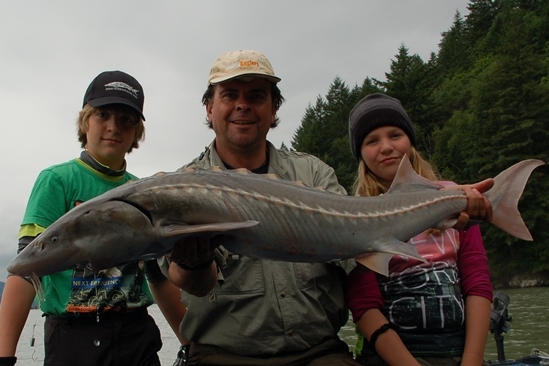 Sturgeon is definitely not everywhere and this is where the experience of the guide kicks in! And then, last but not least, boat handling skills are essential to be able to anchor safely and precisely in the (sometimes very strong) currents on the hotspots! John first heads to a side stream with very clear waters. 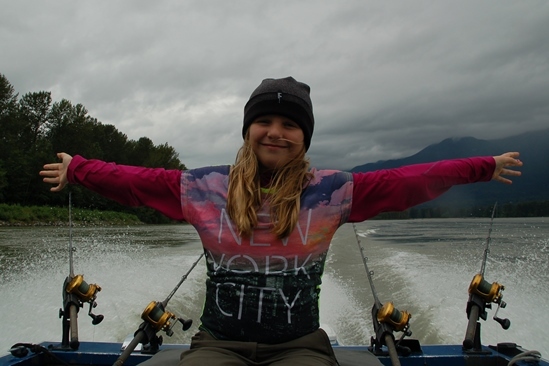 Here we will catch some fresh baits before we head off to the main river to fish for sturgeon. 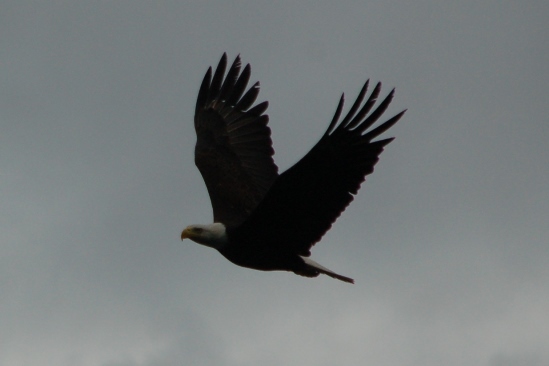 The weather is mediocre, it is grey and we have a drizzle, but the nature is fantastic! Beautiful landscapes surround the muddy waters of the Fraser river. 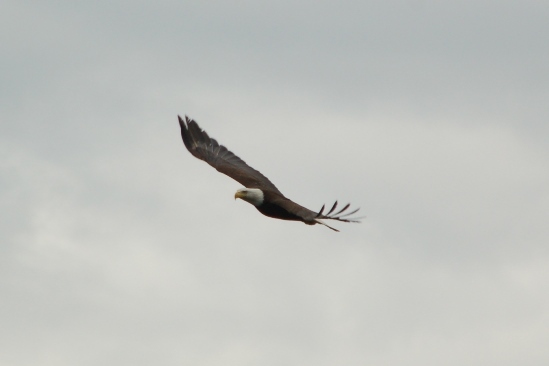 We see several birds flying and on the place where we fish for bait fish we are pleasantly surprised by a bald eagle hunting the same area, amazing! 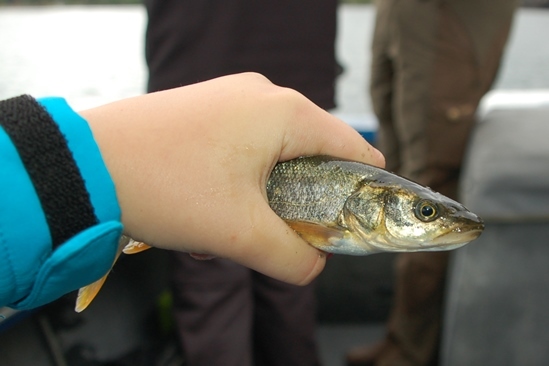 The kids take a lot of fun in catching the small fish Pike Minnow ( and so do I). We take a little extra time to enjoy the action. 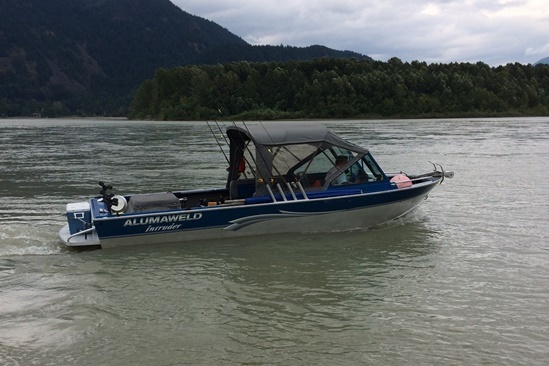 And then we head back to the mighty Fraser river: it is time to catch some sturgeon! The first bite doesn’t take long. Small tips on the top of the rod are followed by a strong take. But when I try to set the hook the fish is missed and the bait is returned to us, totally jammed……..
John rebaits the hook and checks the rigs one more time. It is unusual for a fish not to be hooked (of course….) so he wants to be sure everything is ok. I like it for a guide to be precise! Time passes by and we are enjoying the nature whilst waiting for the next bite. 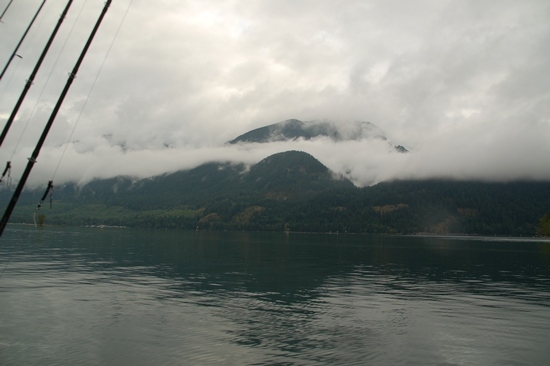 British Colombia nature is astonishing. 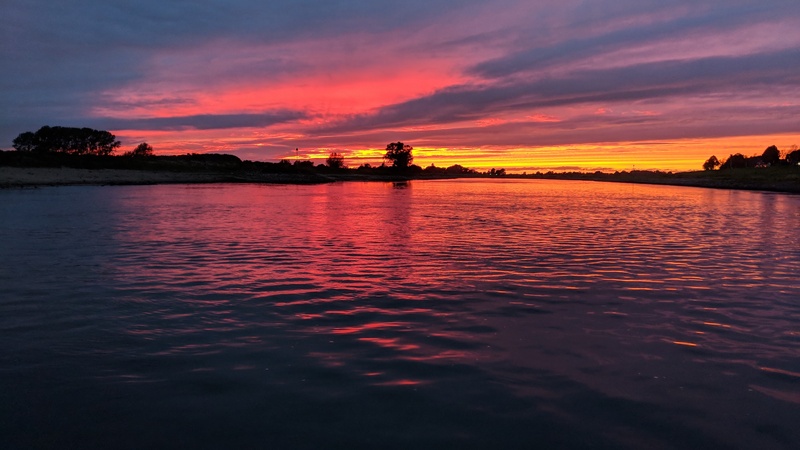 It is one of the very few places on the world where I actually do not mind too much not getting a bite; the scenery is just too wonderful! But fortunately one of our rods is taken suddenly, the rod bends in and I set the hook strongly. Yes, fish on!! The first fight has started. The fish takes a little bit of line and hangs nicely in the current. I soon recognize it is a nice fish but not a monster. 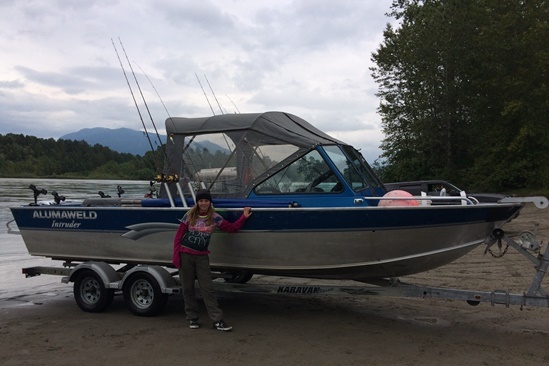 And shortly thereafter she shows herself at the boat. John lifts her into the specially designed cradle in the boat which is filled with fresh water to keep the fish alive. 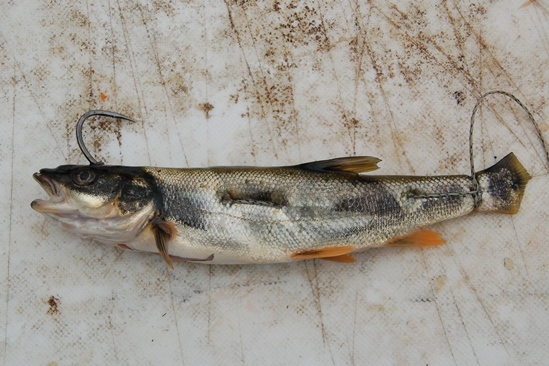 The hook is carefully removed and the fish measured. So far nothing special. But then John takes out a scanning device and scans the fish if any tags are present! 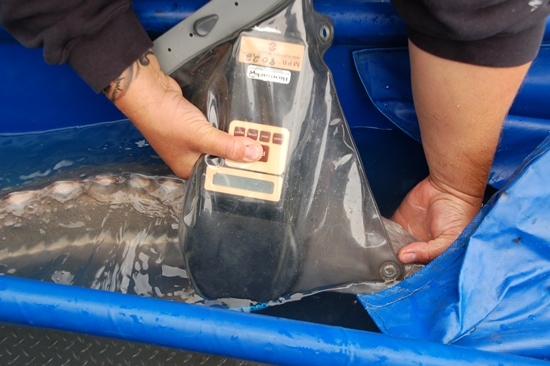 Sturgeon are closely monitored in this part of the world and most guides have this scanning device on board. 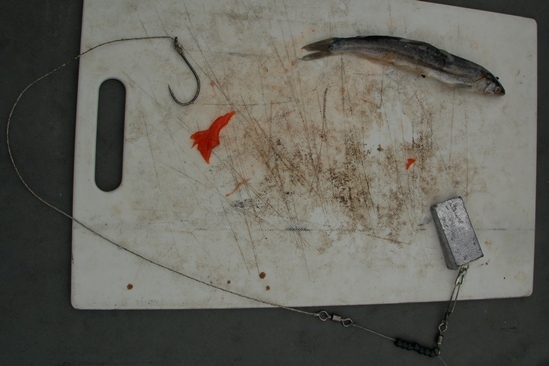 If a tag is found the display shows a number which is registered together with some other details of the fish and catch. 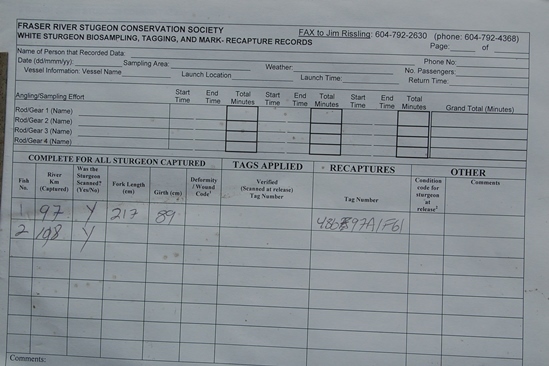 This is then sent in to the Sturgeon Conservation Society. Who sent you some historical data of the fish in return. If a scan is not found the guide himself places a tag under the skin of the fish and makes sure this is registered as well. A very nice technique of fish monitoring which I think could be useful to some of our fish in Europe as well! The fish holds a tag indeed! After the registration and after some fantastic picture taking the fish is safely returned to the water and we all celebrate the first sturgeon! The first one of the day! 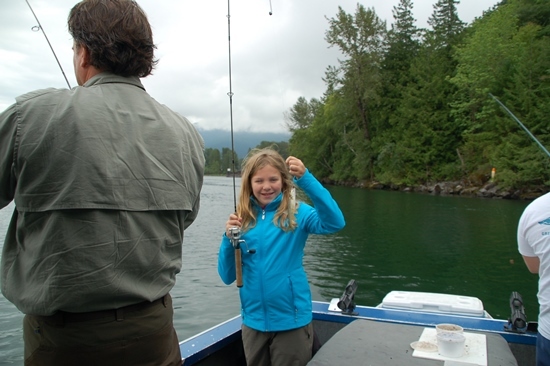 We continue the fishing in different spots and although my daughter enjoys the speed of the boating we do not get any further bites. On top of that the weather deteriorates and it starts to drizzle. For that we are not too lucky. We are getting close to the end of the day when suddenly one of the rods bends in. I ask my son to pick up the rod and soon he is fighting a fish! I am happy because although it is not a monster it is always nice to end the day with a fish. Jelle fights the fish nicely and soon also this fish is landed into the boat. This fish also holds a scan and after the picture taking is soon released into the water. 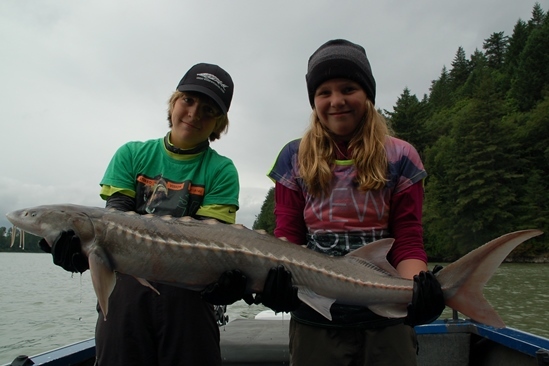 We end the first day with two sturgeons and one miss. Plus some serious baitfish fishing which was nice with the family. It was slower than expected but still nice: we did catch fish! I hope everyone can imagine how proud I am of the picture with my family holding this beautfiful prehistoric fish in this wonderful scenery! And tomorrow there is another day! Nice story! Ben benieuwd of het mij aan de andere kant van de grens ook gaat lukken..
Prachtplaat van je zoon met die steur !